This is a post I wrote last year. I am republishing it because it needs to be said again. Homeschooling is not for everyone at all times, but it is right for us right now. 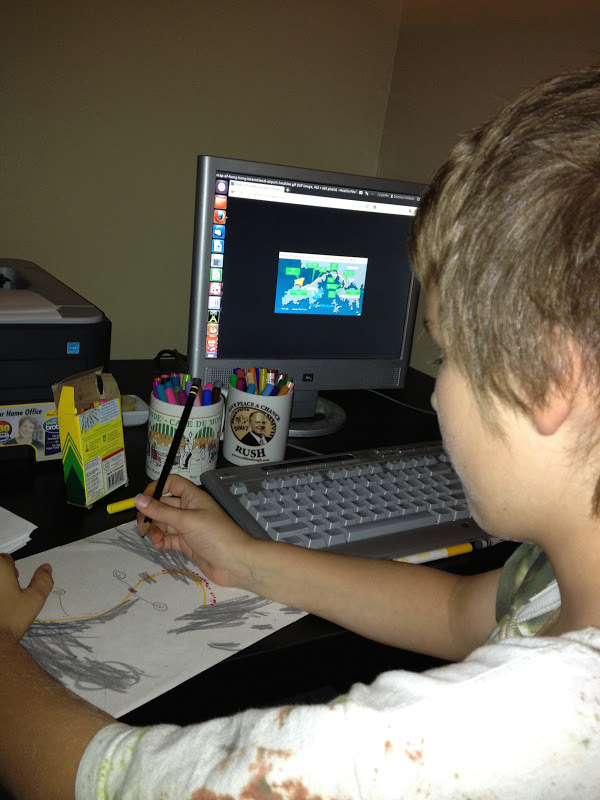 I am thankful that we are able to homeschool, and I hope that I always will be. Several times each year, I get asked questions by people I know, or barely know, about homeschooling. They want to know my opinion. They want advice. They want me to help them along the path of homeschooling. And every single time, I want to say, "Run away. Run away!" It's not that I don't like homeschooling. I do. I love homeschooling. Except when I don't. When I don't love homeschooling, I hate it. Being a stay-at-home mom is very different from being a homeschool mom, at least for me. For example, if my children were in school, I could do my housework, then weave, knit, paint, sleep, blog. I miss being able to do my grocery shopping during the day. I wouldn't be solely responsible for the outcome of their education. Were they in school, I could blame the school system on anything that went wrong with their education. Ah, the bliss of being able to blame others for results you don't like! But here's the deal. Those are all selfish reasons for not wanting to homeschool. I have just as many selfish reasons for enjoying homeschooling. I get to spend time with my kids, time I would not have with them otherwise. I don't have to help my kids with homework (shudder). I know exactly what my children are learning. I know when my children are struggling and when they're excelling. If we want to take a vacation at an odd time of year and avoid the crowds, we can. I don't have to advocate for my child with anyone but myself. Homeschooling isn't all roses and ice cream for the students, either. You have to be with your mom all. Day. Long. If that weren't enough, your mom knows exactly what you're doing all the time! It can be harder to make friends since you're not consistently with other children. There's no competitiveness like there is in school. (This was from Gabriel, who apparently feels the need to compete with other students.) The parents and children will be together all the time, which can be detrimental to their relationship if they get in an argument. (Again from Gabriel.) You're with your family more often. On the other side of the fence, homeschooling is wicked good. You get to stay at home during the day. You get to be with your family more often. You get to pet your cat. You can learn as fast or as slow as you need to. You have some freedom with what you can do for school. Although there are the basics that homeschoolers have to do, they can choose what they want to add on. You can set an end goal as to what you want to accomplish at the end of the year, then go about it the way that works best for you. Some students respond to more structure, others respond best to less structure, and you can find what works for your student. (This portion of the post was written by Gabriel.) The child has the opportunity to learn so much more than they would in school. After all, they aren't weighed down with things they've already learned, discipline problems, and rules that seem odd to them. If they have to have a late night out, they can sleep later the next day without it interfering with their learning. They can truly learn instead of memorizing a bunch of facts to spit out on a test. They don't have to worry about standardized tests. Oh, the pressure of those standardized tests. But, that's a completely separate post. Let's face it. The benefits my children and family get from homeschooling far outweigh the cons. There's very little chance of me wanting to stop homeschooling. But, if you catch me in the middle of wanting to do mom stuff instead of teacher stuff, or me stuff instead of kid stuff, or agonizing over lack of friendships for my children, you won't get the homeschool ambassador. Come back the next day and you might get to talk to the ambassador instead of the guard.